In Q2 2018, the revenue of China’s ferrous metal smelting and pressing sector rose by 20.4% y/y to RMB 1.6tn, as a result of higher selling prices and sales volumes of steel products. According to Lange Steel Information Research Center, at the end of Q2 2018 the demand for steel in China started to weaken, as heavy rainfalls in the Yangtze delta region and the hot weather in many Chinese regions curbed construction activities. 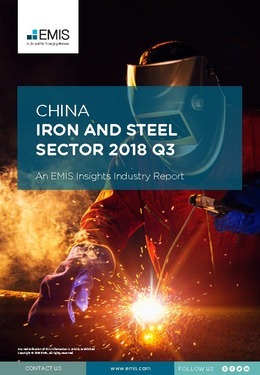 Lange Steel Information Research Center expects consumption of steel in China to experience a y/y decline in Q3 2018. In Q2 2018, the total profit of the ferrous metal smelting and pressing sector marked a sizeable y/y growth, reaching RMB 107.8bn, compared with just RMB 48.6bn in Q2 2017. On the one hand, it was related to the higher sales volumes and prices, and on the other hand, the government’s continuous efforts to cut excess capacity in the sector as part of the country's supply-side structural reform improved the sector’s efficiency. In the first seven months of 2018, China eli minated 24.7mn tonnes of outdated crude steel capacity, completing more than 80% of this year’s 30mn tonnes capacity-cut target, according to the National Development and Reform Commission (NDRC). This report provides a complete and detailed analysis of the iron and steel casting sector for China. EMIS Insights presents in-depth business intelligence in a standard format across countries and regions, providing a balanced mix between analysis and data. Build a clear picture of trends and issues for sub-sectors (e.g. iron ore, crude and finished steel, pig and sponge iron).